After a brief Internet issue, my home for the next four months is officially perfect! 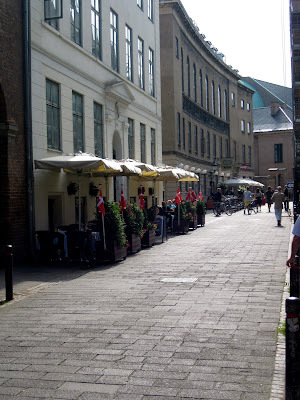 The building is located less than a five minute walk from the main DIS (Danish Institute for Study Abroad) offices, right in the middle of Copenhagen. We are on St. Kannikestaede (said: store canick-cuh-stell), only one street over from Stroget, the huge pedestrian-only shopping street in the city... me + that short of a walk to awesome stores = trouble. There are also lots of little shops and cafes right outside of both the front and back entrances of our building. The building was built in 1751. The owners just finished remodeling it Friday (as in less than a week ago), so we are lucky enough to be the first residents. There are five floors total, including the basement and attic. The basement has laundry and the attic is in the process of being completed - maybe pictures of that later, because you can see the inside of the ancient roof... cooler than it sounds! I live on the "S" floor, which stands for stuen (pronounced: stoon), and there are two floors of people above us. Apparently, it's common here to have an S floor, and then begin numbering the floor above, considered the second floor by Americans, as 1. Once you come inside the back door, you enter the kitchen, which is incredible! Two refrigerators, super fancy microwave, hidden dishwasher, four burner stove, and a little baby oven. My roommates and I, two guys and three girls, made our first "family" meal last night. Precious, I know. You then walk into the living area, which also has an eating area. Not pictured is a picture of our dear friend, His Lordship Sir Percival Leslie (1786-1842). The building is filled with these beautiful original oil paintings that DIS Housing has purchased from estate sales and auctions. If you turn right from this room, you enter my room! I share a triple, and a have a bed near a window that looks over the street. The room is huge, and my roommates and I all have our own closets and personal spaces. This may or may not be the most ideal triple set up I have ever heard of. Move-in day, so excuse the suitcases and assorted other crap everywhere. I didn't take a picture of the boy's room, but they have a double that is a bit smaller than our room. There are two bathrooms, and then a single that our Danish roommate, Nicoline lives in. Finally, there is a courtyard out back that is common to our building, and the two other residential buildings at St. Kannikestaede 11 and Skindergade 14. The pink building is home to future classrooms - how insanely convenient is this going to be?! I think that's about everything! I need to shoot a few more pictures of some of the flat's details, but you get the basic idea. Classes start tomorrow, and I cannot wait to meet profs / get a routine / figure out how intense the workload will be. So far, the past three days have been like O-Week at W&L all over again, except with a bar scene. There were free shots of this licorice flavored drink at this one bar on Monday night.... apparently a favorite with Danes, I can't say I immediately felt the love. On the bright side, I discovered what is essentially Listerine alcohol... minty fresh! This looks awesome! Come visit me in Spain sometime this term!